Complete nasal obstruction in a newborn may cause death from asphyxia. During attempted inspiration, the tongue is pulled to the palate, and obstruction of the oral airway results. Vigorous respiratory efforts produce marked chest retraction. Increased cyanosis and death may occur if appropriate treatments are not available; however, if the infant cries and takes a breath through the mouth, the airway obstruction is momentarily relieved. Then the crying stops, the mouth closes, and the cycle of obstruction is repeated. Choanal atresia is depicted in the image below. Choanal atresia. Rhinogram demonstrating blockage of radiopaque dye at the posterior choanae. From T.L. Tewfik and V.M. Der Kaloustian, with permission. Computed tomography (CT) scanning is the radiographic procedure of choice in the evaluation of choanal atresia. For good results, careful suctioning is performed to clear excess mucus, and a topical decongestant is applied. Treatment can be divided into emergent and elective definitive categories. Bilateral choanal atresia in a neonate is an emergency that is best initially treated by inserting an oral airway to break the seal formed by the tongue against the palate. This oral airway can be well tolerated for several weeks. Transpalatal repair is a technique that provides excellent exposure and has a high success rate but requires more operative time. The increased blood loss and the possible occurrence of palatal fistula, palatal dysfunction, and maxillofacial growth disturbance are complications of this procedure. Microdebriders continue to advance the field of endoscopic surgery, providing clearer operative fields and causing less tissue trauma for experienced surgeons. Procedures using carbon dioxide and potassium titanyl phosphate (KTP) lasers are easy and quick and create minimal discomfort for the patient. The time of hospitalization is short, and the operation can be repeated if a good result is not initially achieved. Most importantly, a stent is not usually needed. The use of stents in the treatment of patients with choanal atresia is a controversial subject. Some surgeons believe that stents are useful in stabilizing the nasal airway in the postoperative period to prevent the development of stenosis by maintaining a lumen. However, others believe that stents may act as a nidus for infection and may induce a foreign body reaction; this may contribute to choanal restenosis. Therefore, the use of stents following repair of choanal atresia requires the use of prophylactic antibiotic and antireflux medications. In 1755, Roederer first described congenital choanal atresia; therefore, this condition has been recognized for more than 200 years. In 1854, Emmert reported the first successful surgical procedure for congenital choanal atresia in a 7-year-old boy using a curved trocar transnasally. Over the years, the necessity of serial dilatations to maintain patency of the choanae has been clearly recognized. The average rate of choanal atresia is 0.82 cases per 10,000 individuals. Unilateral atresia occurs more frequently on the right side. The ratio of unilateral to bilateral cases is 2:1. A slightly increased risk exists in twins. Maternal age or parity does not increase the frequency of occurrence. Chromosomal anomalies are found in 6% of infants with choanal atresia. Five percent of patients have monogenic syndromes or conditions. Choanal atresia occurs with equal frequency in people of all races. Lee et al (2012) evaluated the association between continuous and categorical infant T4 levels and nonsyndromic choanal atresia. They suggest a role of low thyroid hormone levels in the development of choanal atresia, or that low newborn T4 levels are potential proxy measures of a risk factor present during the critical period of development. The clinical evaluation includes a complete physical examination to assess for other congenital anomalies. A small feeding tube could be used to determine the patency of the choana, but a complete nasal and nasopharyngeal examination should be performed using a flexible fiberoptic endoscope to assess the deformity. A simple method using the automatic tympanometer to screen newborns for congenital choanal atresia was recently published. The sensitivity and specificity of the technique in diagnosing a patent nostril was reported as 100%. 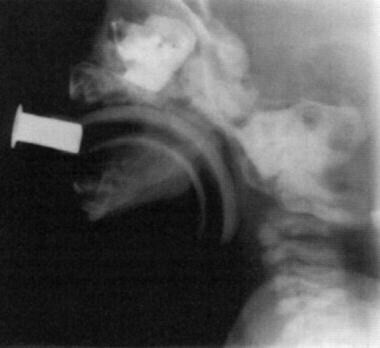 However, a high level of suspicion is required to diagnose bilateral choanal atresia. Symptoms of severe airway obstruction and cyclical cyanosis are the classic signs of neonatal bilateral atresia. When crying alleviates respiratory distress in an obligate nasal breather, the neonatologist should be alerted to the probability of bilateral choanal atresia. Unilateral atresia may not be detected for years, and patients may present with unilateral rhinorrhea or congestion. Assanasen P, Metheetrairut C. Choanal atresia. J Med Assoc Thai. 2009 May. 92(5):699-706. [Medline]. Hassan M, AboEl-Ezz T, Youssef T. Combined transoral-transnasal approach in the repair of congenital posterior choanal atresia: clinical experience. J Otolaryngol Head Neck Surg. 2011 Jun 1. 40(3):271-6. [Medline]. Kwong KM. Current Updates on Choanal Atresia. Front Pediatr. 2015. 3:52. [Medline]. [Full Text]. Barbero P, Valdez R, Rodríguez H, et al. Choanal atresia associated with maternal hyperthyroidism treated with methimazole: a case-control study. Am J Med Genet A. 2008 Sep 15. 146A(18):2390-5. [Medline]. Lee LJ, Canfield MA, Hashmi SS, Moffitt KB, Marengo L, Agopian AJ, et al. Association between thyroxine levels at birth and choanal atresia or stenosis among infants in Texas, 2004-2007. Birth Defects Res A Clin Mol Teratol. 2012 Nov. 94(11):951-4. [Medline]. Kancherla V, Romitti PA, Sun L, et al. Descriptive and risk factor analysis for choanal atresia: The National Birth Defects Prevention Study, 1997-2007. Eur J Med Genet. 2014 Feb 24. [Medline]. Morokhoev VI. [Endonasal surgery of choanal atresia]. Vestn Otorinolaringol. 2010. 10-5. [Medline]. Karligkiotis A, Farneti P, Gallo S, et al. An Italian multicentre experience in endoscopic endonasal treatment of congenital choanal atresia: Proposal for a novel classification system of surgical outcomes. J Craniomaxillofac Surg. 2017 Jun. 45 (6):1018-25. [Medline]. Prasad M, Ward RF, April MM, Bent JP, Froehlich P. Topical mitomycin as an adjunct to choanal atresia repair. Arch Otolaryngol Head Neck Surg. 2002 Apr. 128(4):398-400. [Medline]. Carter JM, Lawlor C, Guarisco JL. The efficacy of mitomycin and stenting in choanal atresia repair: a 20 year experience. Int J Pediatr Otorhinolaryngol. 2014 Feb. 78(2):307-11. [Medline]. Cedin AC, Fujita R, Cruz OL. Endoscopic transeptal surgery for choanal atresia with a stentless folded-over-flap technique. Otolaryngol Head Neck Surg. 2006 Nov. 135(5):693-8. [Medline]. Newman JR, Harmon P, Shirley WP, Hill JS, Woolley AL, Wiatrak BJ. Operative management of choanal atresia: a 15-year experience. JAMA Otolaryngol Head Neck Surg. 2013 Jan 1. 139(1):71-5. [Medline]. Bedwell J, Shah RK, Bauman N, Zalzal GH, Preciado DA. Balloon dilation for management of choanal atresia and stenosis. Int J Pediatr Otorhinolaryngol. 2011 Dec. 75(12):1515-8. [Medline]. Zeitouni AG, Shapiro RS. Congenital anomalies of the nose and anterior skull base. Tewfik TL, Der Kaloustian VM, eds. Congenital Anomalies of the Ear, Nose, and Throat. New York, NY: Oxford University Press; 1997. 189-200. Choanal atresia. CT scan showing membranous and bony choanal atresia. From T.L. Tewfik and V.M. Der Kaloustian, with permission. Choanal atresia. Diagram illustrating the transpalatal correction of choanal atresia.